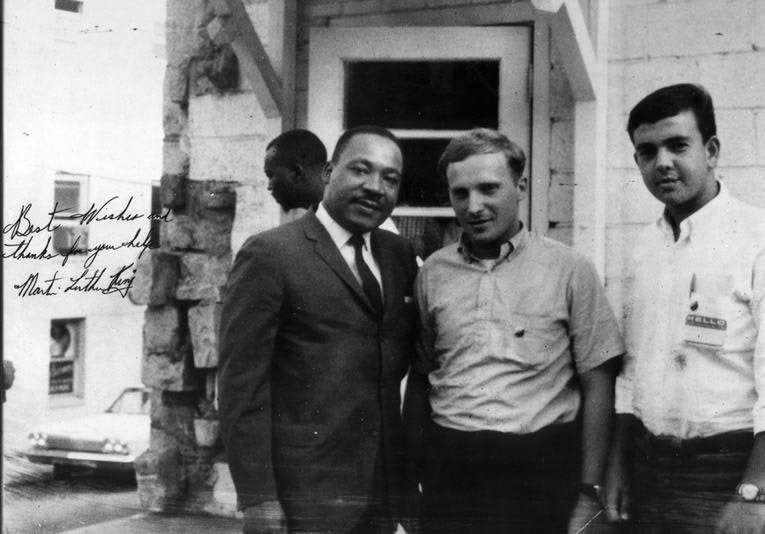 Reader Peter Geffen sent in this signed Polaroid of himself (center) and fellow civil rights worker Mickey Shur with Martin Luther King, Jr. outside of the Ebenezer Baptist Church in Atlanta in 1965. Geffen went on to found the Abraham Joshua Heschel School. Shur went on to become the Hillel director of Queens College and the City University of New York. It was a turning point for America. After decades of struggle, President Lyndon Johnson signed the Civil Rights Act of 1964, ushering in an era of new protections for the civil liberties of all Americans. While imperfect, the Act took the unprecedented step of guaranteeing equal protection under the law and equal voting rights (with the passage of the 14th and 15th Amendments, respectively). The Act resonated for decades, paving the way for future civil rights legislation for women and Americans with disabilities. “Seven years out of Columbia Law School, I answered the call for volunteers when the Lawyers’ Committee for Civil Rights under Law was asked by The National Council of Churches to send lawyers to Mississippi to defend approximately 1,000 summer volunteers if and when they were arrested. I arrived in Ruleville, Mississippi July 29, 1964 after flying to Jackson, Mississippi for my two-week tour of duty. I stayed across the street from the home of Fannie Lou Hamer who took great pleasure in pointing out the bullet holes on her front porch. I actually won half the cases I tried, and those clients were set free to go back to work on voter registration. I grew to have enormous respect for the summer volunteers who did not receive the same courtesy and respect that was given to me. Returning to my wife and small children, I called a number of the parents of the summer volunteers to alleviate their anxieties. ‘A DISGR-R-R-ACEFUL TRAVESTY….’ (sic), words I used to refer to the racial discrimination prevalent in housing in Rhode Island at that time. The issue was close to my heart, because my parents had frequently told me of how difficult it had been for them as Jews when they tried to find housing in 1937, when they were married. Six years later, on the day Martin Luther King, Jr. was assassinated, I was working at the Richmond, California YWCA with teenage unwed mothers from a very poor neighborhood. As I picked them up in a large Red Cross station wagon on the way to our meeting place at the Y, we listened as the radio described the tragic event in Memphis. I recall the tears of those pregnant girls, some as young as 13. It felt as if each of them had lost a close relative.